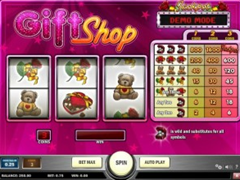 Gift Shop Pokie Review - Play Today! This game offers players exclusive entrance to the gift shop that offers gifts of the heart. Play’N’Go offers a lovable game with a large variety of winning combinations on the classical love pokie in the form of a shopping spree, that takes players down the 3 reels with a lucky single payline. Select the greatest gifts and enjoy the additional winning chances that is gifted to you by the diamond ring wild symbol. The game has yet another gift in store as this pokie offers players the opportunity to trigger the progressive jackpot. Single payline games can be most rewarding with the smallest wager. There is only 1 line to wager on, which means you will wager a lot less and your winnings will be a lot bigger. This game offers a progressive jackpot, which means a set coin value will be used, the value is $0.25 and cannot be change. You will be able to bet up to $0.75 by placing 3 coins on the single line. The bright pink Gift Shop presentation gets your winning attention and the 3 reels are eager to form winning combinations from the variety of symbols that includes beautiful red roses with golden satin bows, cute tift Shop Pokie Review, Play’N’Go pokies, pokie review, video pokies, pokie, Australian pokieseddy bears with a red heart on his knitted jersey, heart shaped red box of delicious chocolates and a huge diamond fitted on a golden ring, presented in a maroon ring case. The main screen offer pay-out tables that conveniently informs players of the payout amounts on any of the winning combination and the effect that the bet they placed would have on the winnings. The ring in the red box will bring the wilds from the gift shop. You can get these symbols on any of the reels to complete combinations and award you with the winnings. Combinations completed will feature the same payout as those displayed in the winnings-table. The progressive jackpot amount will be offered when you get all 3 ring boxes on the paylines with 1 spin. The progressive jackpot amount will be displayed above the winnings-table at all times. This is yet another of the great classical games Play’N’Go created with such beautiful detail. Uncomplicated play allows for great wins on the reels. The game offers a lot of fun with continues wins and a really nice background sound that totally relax players in between spins.